A lookback period is the length of time that the IRS uses to measure the amount of taxes paid by an employer. The lookback period also helps the employer determine its deposit schedule. Employers must withhold federal income tax, Social Security tax and Medicare tax from employees’ wages, plus pay their own share of Social Security and Medicare taxes. These taxes must be paid together to the IRS. Most employers must report these taxes to the IRS quarterly via Form 941. However, small employers with a tax liability of $1,000 or less may be allowed to file annually via Form 944. The amount of taxes you reported during your lookback period dictates your deposit schedule — which can be monthly or semiweekly. The actual time frame that makes up this period depends on whether you’re a Form 941 or a Form 944 filer. To determine whether your federal income tax, Social Security tax and Medicare tax deposits are due monthly or semiweekly, you’ll need to know the amount of taxes reported during your Form 941 or Form 944 lookback period. The lookback period for Form 941 filers comprises 12 months — covering four quarters, starting on July 1 and ending on June 30. Your deposit schedule is monthly if you reported a tax liability of $50,000 or less during the four-quarter lookback period. In this case, your tax liability for each month is due by the 15th of the following month. Your deposit schedule is semiweekly if you reported a tax liability of more than $50,000 during the four-quarter lookback period. In this case, deposits for paydays that fall on Saturday, Sunday, Monday or Tuesday are due by the following Friday. Deposits for paydays that fall on Wednesday, Thursday or Friday are due by the following Wednesday. The lookback period for Form 944 filers is the second preceding calendar year. For example, the period for 2019 is calendar year 2017. 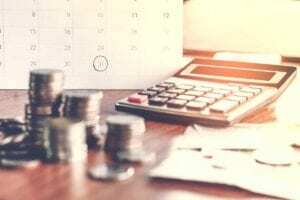 The same $50,000 threshold that is used to determine deposit schedules for Form 941 filers is also used to determine deposit schedules for Form 944 filers. For example, if you reported a tax liability of $1,000 in 2017, your deposit schedule is monthly. But if you reported a tax liability of $60,000 in 2018, your deposit schedule is semiweekly. Note that this article covers only the basics of lookback periods and does not include the many nuances that come with this IRS designation. For more information, consult IRS Publication 15 or contact your payroll provider. Learn more about payroll tax services.